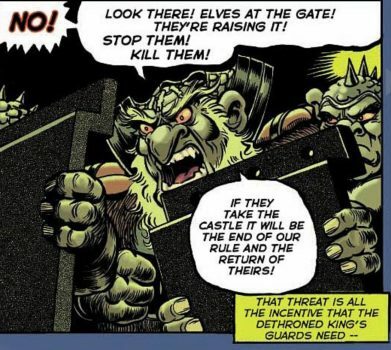 In ElfQuest’s Original Quest, it wasn’t until the very final moments of the elf-troll war that we learned the Frozen Mountain trolls’ true motivation for keeping the elves away from the Palace of the High Ones. It wasn’t greed, it was fear. Knowing what we do now at the conclusion of Final Quest–namely, that the Firstcomer Troll still lived, and lived so long in enduring fear of the elves and of being pressed again into unwilling service–we can see troll King Guttlekraw in a whole new light. A contemporary of Old Maggoty, one of the first-born trolls on the World of Two Moons, Guttlekraw would have carried this fear for thousands of years. He would have learned it directly from the Firstcomer Troll, as unquestionable wisdom from his most ancient and revered ancestor. When the glacier that had for so long hidden the Palace retreated, and the Go-Backs arrived in answer to the newly-freed vessel’s call to its elfin creators, that was all the evidence Guttlekraw needed to know that his ancient dread was real, and he must take every measure to keep the elves from the Palace. In a way, you can’t blame him. 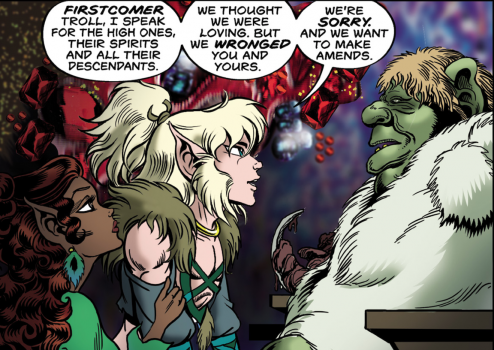 Thinking on this now makes Cutter-Tam/Timmain’s apology and the Firstcomer Troll‘s acceptance of it in Final Quest that much more powerful for me. This is a complex, 40-years-in-the-telling story of the profoundly sad effect that taking away others’ choices can have. It speaks to the powerful grip of fear and vendetta on one’s soul, and the horrors that result from it all–but it also shows the healing power of rising above these dark things by owning your wrongs, and by giving and accepting apology and forgiveness. Guttlekraw is no hero, as he allowed fear to fester into malice and cruelty. But with the completion of ElfQuest-Final Quest, his story has become another brilliant example of one of the saga’s most powerful lessons: that the real conflict in life is not between good and evil, but rather between knowledge and ignorance, between love and hate… and the choice we make whether to embrace our higher selves and rise above, or cling to our lowest selves and wallow in fear. Join the ongoing discussion of this post in the ElfQuest Fan Group on Facebook.